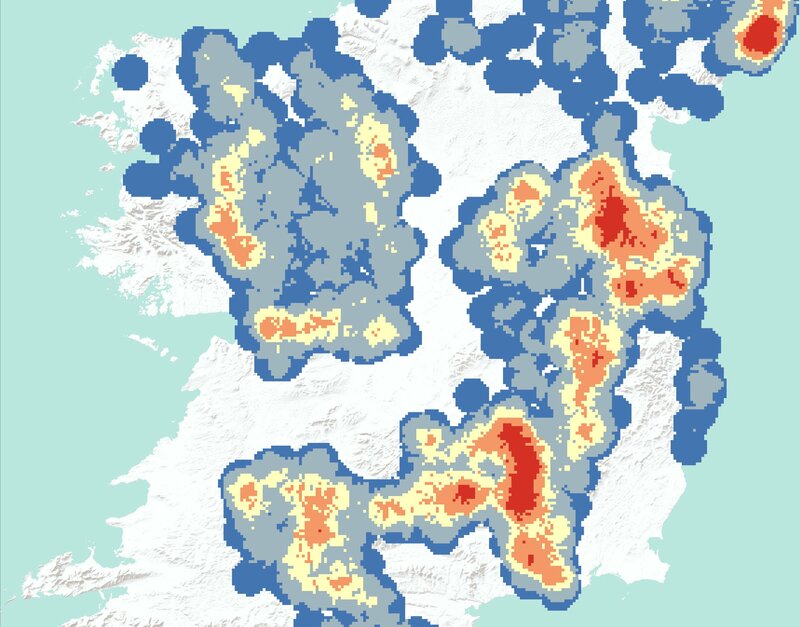 Researchers from Trinity College Dublin have produced a series of ground-breaking maps that illustrate the distribution of wealth in Ireland circa 1300. These maps, which are based on early 14th Century papal taxation sources, help to define the extent and impact of the medieval English colony by using parish incomes as proxies for local wealth. To better understand the sources used, and the nature of medieval papal taxation, Christopher Chevallier visited archives in Armagh (the Robinson Library), Paris (Archives Nationales), and Kew (The National Archives). Additionally, he went on fieldwork to the Vatican Secret Archives to handle and analyse a variety of medieval documents. Map A reflects the economic state of Connaught before the Invasion, whereas Map B focuses on County Clare after the Invasion. Map C reflects parish density before the Invasion. Full captions and credit information for the maps is available at the foot of this release. Map C: Density analysis was performed on the parishes contained within the 1302-7 valuations, demonstrating markedly higher density within colonial regions. Such analyses can be used to explore the demography of medieval Ireland, as well as the interplay between the physical environment and economic development. Christopher Chevallier has also identified great potential for pan-European studies using papal tenth taxations. He has already mapped some parts of Great Britain, Switzerland, and France to illustrate this.